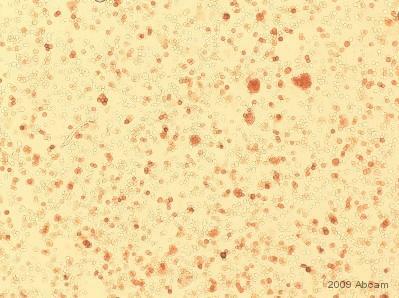 Tissue, cells or virus corresponding to Influenza A Virus M2 Protein. Full length M2 protein from A/WSN/33-infected CV1 cell lysate. Detects the N-terminal of the Influenza A Virus M2 Protein. Influenza A virus is an enveloped virus encoding 10 polypeptides. RNA segment 7 encodes for two proteins: M1 (matrix 1) and M2 (matrix 2). M1 protein is encoded by an mRNA that is colinear, while M2 protein is synthesized from spliced mRNA. M2 protein is a transmembrane protein composed of three Domains: 1) 24 residues representing the N-terminal region, 2) 19 hydro-phobic residues that serve as a membrane anchor, and 3) 54 residues near the C-terminal in the cytoplasmic domain. The M2 protein has been found to play a role in Influenza replication and assembly of virion particles. Further experimentation has demonstrated that this protein is an acid-activated ion channel for virus replication. Our Abpromise guarantee covers the use of ab5416 in the following tested applications. ICC Use a concentration of 1 µg/ml. WB Use a concentration of 1 µg/ml. Detects a band of approximately 15 kDa. The Matrix protein M2 forms a protons channel. When the environmental pH is lower than a threshold, the M2 channel is activated and selectively transports protons accross the membrane from the extracellular side to the cytoplasmic side. It is crucial for the uncoating process. When the virion is internalized into the endosome the channel can acidify the virion interior, promoting the dissociation of the viral matrix protein (M1) from the ribonucleoprotein (RNP) thus allowing the transport of the RNP from the virion into the cell’s nucleus. For some influenza virus subtypes, the M2 channel can elevate the intravesicular pH of the trans Golgi network, preventing the viral protein haemagglutinin, which is transported to the cell surface through the trans Golgi network, from incorrect maturation in an otherwise low pH environment. 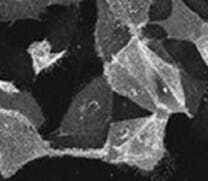 Virion membrane. Apical cell membrane; Single-pass type III membrane protein. Immunofluorescence staining of infected MDCK cells using ab5416. Publishing research using ab5416? Please let us know so that we can cite the reference in this datasheet.